The Ports of Los Angeles and Long Beach might be some of the world’s busiest shipping facilities, but just beyond the stacks of shipping containers and bustling cranes sit densely populated neighborhoods that have struggled for decades to maintain a vital hold on the nearby waterfront. That dynamic is about to change, as a slew of transformative waterfront-adjacent projects aim to reclaim and transform the shore for nearby communities. Following a new master plan issued in 2014, the waterfront areas along the Port of L.A.–adjacent neighborhood of Wilmington have been in a continual state of restoration and redevelopment. There, Boston-based Sasaki built out the first phase of the Wilmington Waterfront Park in 2012, a 10-acre installation packed with natural berms, playing fields, and trees. The plans—developed with Studio-MLA—would create a “buffer against port operations” and a “window to waterfront,” according to Zach Chrisco, partner in charge of the project at Sasaki. The latest phase of the waterfront redevelopment project aims to recast the existing waterfront areas with more widely accessible leisure and shopping spaces connected by public amenities like a giant lawn, stepped landings that meet the water, a small floating harbor, and a fishing pier. “Our goal with the project is to diversify the way the community can engage with the water,” Kate Tooke, landscape architect at Sasaki, explained, describing the metallic shade structures and an open-floor leisure pier with hammocks that dangle directly over the water. The waterfront will connect to the Wilmington community via the Avalon Promenade and Gateway, a new promenade and pedestrian bridge sequence designed by T.Y. Lin International that will feature underground restrooms on one end and a public plaza on the other. Both projects are slated to break ground this year with an anticipated 2019 opening. In the nearby neighborhood of San Pedro, developers Ratkovich Company and Jericho are leading the Ports O’ Call Village redevelopment project aimed at bringing a new 180,000-square-foot San Pedro Public Market project to life. The development is led by Rapt Studio, a local design firm. Describing the lead-up to the project, Sam Farhang, Rapt Studio president and project lead said, “We went in immediately and said, ‘This is not a project that could be designed and delivered by single team.’” The designers got to work on assembling a “dream team” for the project that includes James Corner Field Operations and Adamson Associates as executive architects. Rapt is designing a series of new warehouse-like prefabricated steel moment frame structures flexible enough to hold new retail programs while remaining malleable over the developer’s 55-year ground lease over the site. Plans call for adding a new “town square” containing the aforementioned retail and plaza spaces, a new marketplace to hold the relocated San Pedro Fish Market, and an event lawn that connects to the waterfront directly so that “every type of person—whether it’s longshoremen on their lunch break or a Millennial mom and dad with a single child in a stroller—can find an aspect of this site that resonates with them.” The project will be delivered in phases through 2020 or 2021 as to not displace some of the larger tenants that will remain. Across one of the shipping channels, Gensler is working toward a long-term vision that would rework the area’s employment and economic demographics, as it builds out the multi-phase AltaSea development; a new 35-acre complex that will combine marine research, public education programs, and sustainable energy development. The $150 million complex will aim to redevelop a series of existing waterfront warehouses, replacing industrial shipping uses with high-tech research equipment and hordes of visiting tourists, school children, and researchers. Describing the goals of the project, Li Wen, design director at Gensler said, “We see the Port of L.A. becoming a place of education through experience,” adding that the project seeks to “re-introduce the ocean as a place to be preserved, revered, and studied.” Work on that project is currently underway and the first phase is expected to be completed in 2023. Columbia Square articulates a pragmatic vision for the future of Hollywood as a mixed-use, creative capital that pays homage to its past without sacrificing density. The original International Style Columbia Square Studios complex, designed by architect William Lescaze in 1938, was used by the Columbia Broadcasting System (CBS) as a West Coast base of operations when most Americans received news and entertainment via radio. The then-state-of-the-art studios and soundstages put Hollywood on the map as an entertainment center and were in continuous use until 2007. The development was acquired by Kilroy Realty in 2012, which renovated and expanded the complex with Rios Clementi Hale Studios and House & Robertson serving as architects and with Historic Resources Group as preservation architects. The complex originally greeted Sunset Boulevard with a roundabout driveway and a collection of storefronts. The studios were located in the five-story Radio building. A series of ancillary structures located behind the driveway and above the retail spaces contained soundstages and offices, respectively. These components—including the operable, historic steel-frame ribbon windows cladding the original buildings—have been restored beautifully. The driveway has been closed off and transformed into a pedestrian plaza, an original grass roundabout updated and replanted with native sedges and artwork. The Radio building now housesthe Los Angeles outpost of NeueHouse, a private arts-focused cultural club. An existing warehouse was reconstructed and reprogrammed as a 15,000-square-foot office space called Studio BC, while new office and apartment towers rise around a central courtyard toward the rear of the complex. That wooden bow-truss structure was formerly used as a sound stage and has been partially deconstructed—the existing truss is preserved as an architectural relic while the new structure rising around it has been designed with expressed steel truss elements that support a curvilinear roof. The new space features a spacious interior design by Rapt Studios, including an open, glass-clad mezzanine-level conference room. A gridded office tower known as the Gower Building rises above and behindStudio BC: The dual-core, 250,000-square-foot structure presents a relatively generic collection of office spaces outfitted with alternating panes of opaque and translucent glass that complement the Radio building’s horizontal ribbon windows. The five-story block rises on a row of circular concrete columns and, toward the northern edge of the site, features terraced sections that have been individually branded by new tenants. 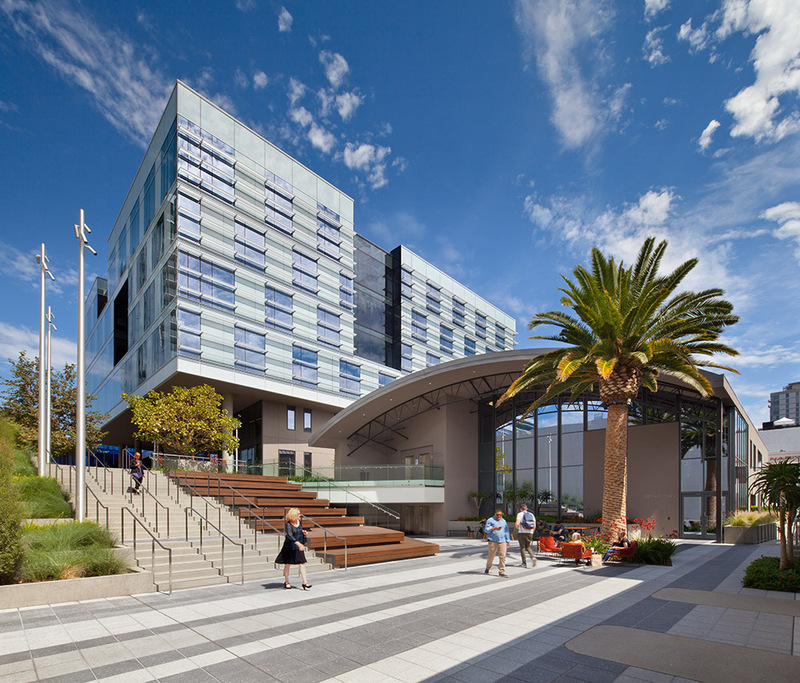 The heart of the campus is the central, multilevel plaza that contains an amphitheater and connects the complex to surrounding streets via a series of pedestrian access points. The plaza also functions as a water-collection system that uses a raised platform to filter water through various vegetated swales and planters. 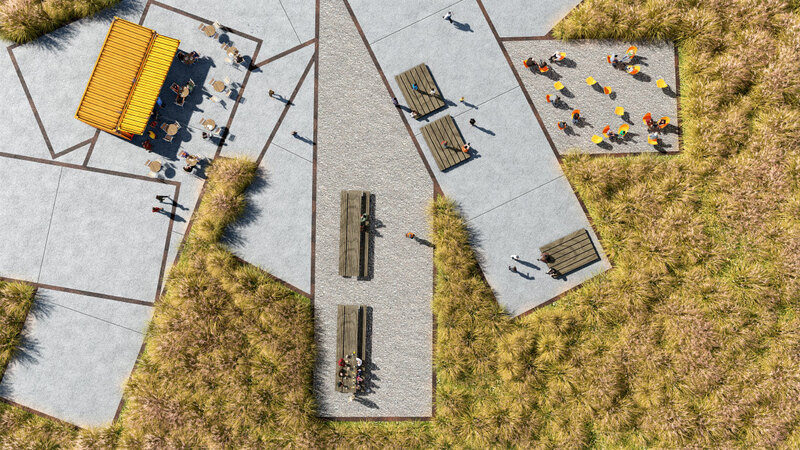 Paved in an abstract geometric pattern, the expanses tie together the site’s requirements—flexible social connectivity spaces, rainwater filtration areas, and a pedestrian-focused connectivity to the surrounding neighborhoods—while utilizing a subdued and comfortable material palette. Opposite the Gower Building is another blocky structure referred to as the El Centro Building, a 106,000-square-foot single-core structure containing several floors of creative offices designed with higher floor-to-floor heights and exposed ceilings. The El Centro Building also contains a 5,500-square-foot terrace overlooking the plaza that will shine as a social space when fully built out and occupied. Topping off the complex is the Hollywood Proper Residences, a 21-story faceted tower containing 200 high-end apartments. The tower design includes work by GBD Architects and features interior designs by Kelly Wearstler. The tower’s silhouette is patterned with alternating vertical bands of the same opaque and transparent curtain walls that clad the Gower Building. The housing tower, both in terms of height and program, establishes the project as a step forward in L.A.’s urban identity and signals a hint of things to come, with several other mixed-use high-rise projects due to appear around and behind historic structures nearby.